After arriving in San Francisco in 1989 from his homeland Sweden, Chef Ola Fendert embarked on an impressive culinary journey in some of the city’s finest establishments, including Scala’s Bistro, Alain Rondelli, Plouf, Chez Papa Bistro and Chez Maman. 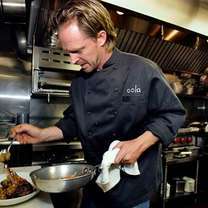 In 2004, he opened Oola Restaurant & Bar. "Pickled shrimp spicy chili dipping sauce #truecooks"
"Breakfast pizza with lamb sausage and cheddar #love"
"Breakfast? Fried dough with chocolate sauce #sanfrancisco"
"Hamachi Castelveltrano smoked tomato tangerine #crudo"
"Oola restaurant Brunch simple is sometimes the best #love"
"Ahi Truffle Pearls Pickled mushrooms #sanfrancisco"